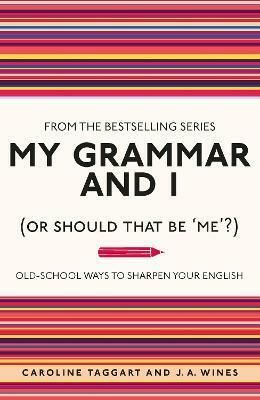 A runaway hit and Sunday Times bestseller in 2008, My Grammar and I has continued to grow in popularity, becoming the go-to guide for grammar. Repackaged with a fresh jacket design, this much-loved gift title is now available in paperback, for new readers and fans of the series alike. My Grammar and I offers amusing examples of awful grammar, while steering you in the direction of grammatical greatness. Taking you on a tour of the English language through the minefield of rules and conditions that can catch you out, from dangling modifiers to split infinitives, it highlights the common pitfalls that every English language user faces on a day to day basis. Refreshing everything you should have learnt at school and more, My Grammar and I is informative yet entertaining: a must-have reference guide for any English language enthusiast. Caroline Taggart has worked in publishing for nearly 30 years, the last 18 of them as a freelance editor of non-fiction. She has edited innumerable natural history titles, notably Jonathan Scott's Big Cat Diary books and the tie-in to the BBC series Walking with Dinosaurs, as well as books on gardening, cookery, health, witchcraft, pop music, the Blitz, the D-Day landings, the House of Commons and the English language. She has also written a handbook for mature students and an encyclopaedia of dogs. The first book Caroline wrote was I Used To Know That, a Sunday Times bestseller published in 2008. This was followed by My Grammar and I (also a Sunday Times bestseller), Answers to Rhetorical Questions, A Classical Education, An Apple A Day and Pushing the Envelope. Her books have appeared in the Sunday Times, Daily Express, Daily Telegraph, the Times, the Sun and many other publications, and her frequent television and radio appearances include BBC1 Breakfast, BBC Radio 4 and BBC Radio 5 Live.